We have met the remarkable Hans Axel von Fersen before, learnt of his adventures and discovered more about a relationship with Marie Antoinette that is still speculated over to this day. Today we return to Sweden on the anniversary of his death to examine a dark moment in the history of that nation. I am delighted to note that the estimable Anna Belfrage is also remembering Axel von Fersen and her blog today features her heartbreaking story of his final hours, The Funerals of a Prince. Fersen's life was one that encompassed travel, intrigue and tragedy and the manner in which he left it was far from ordinary, though it was hardly peaceful either. The road to his death began in 1809, when Sweden's Gustav IV Adolf was swept unceremoniously aside in favour of Denmark's Prince Carl August of Augustenburg. 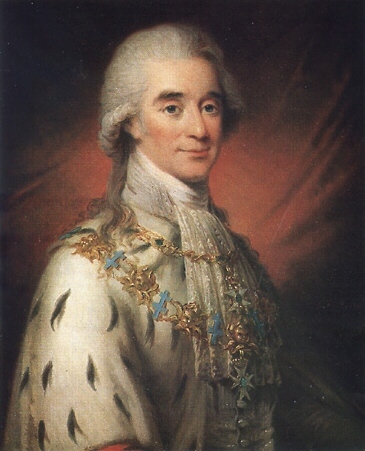 Wisely distancing himself from the intrigue and drama, Fersen openly supported Prince Gustav of Vasa, the son of Gustav IV Adolf and, in Fersen's opinion, the legitimate heir to the throne. In fact, Carl August did not last long in office and died suddenly, despite apparently being in rude health. Although it was later concluded that he had died as a result of a stroke, people began to whisper that Fersen had been involved in a plot to poison the Dane. Despite this unpleasant state of affairs, it was part of Fersen's official duties to accompany the dead man's funeral cortege through Stockholm. Carl August was a popular ruler and thousands turned out to mourn him, disgusted to see Fersen involved in the ceremony. They heckled his carriage and pelted it with stones until, as the mood turned increasingly violent, the unfortunate man attempted to conceal himself in a private house. At this point the mob rushed the building and dragged Fersen out into the street, where they subjected him to a dreadful beating as Royal Life Guards stood by, their commanding officer instructing his men to hold their fire despite other officials pleading that Fersen be arrested for his own safety. Fersen's torment was only ended when Otto Johan Tandefelt jumped on his chest and crushed his ribcage, killing the unfortunate man. In the months that followed his death, Fersen was officially cleared of any involvement in the death of the Crown Prince. He was buried with full honours as a Marshal of the Realm, something of a bitter posthumous victory for the man who had once enjoyed influence at the highest levels. Blimey! I honestly didn't think your tales could become more gruesome but you have proved me wrong in no uncertain terms! A gruesome tale for a sunny day! I must be a bloodthirsty wench because I love your more gruesome tales! A lady after my own grisly heart! O what a tragic brutal end to Axel von Fersen….. for some reason I muddle his final moments with the Earl of Bothwell....maybe the connection is Denmark...Have you any idea how old Fersen would have been at the time of his death ? He was 54 when he was killed, such a horrible death too! Rest in Peace Count Fersen! I hope the worthless lot who killed you got a taste of their own desserts!